Jay Ruttenberg reviewed "David Bowie Is" for Fashion Projects in January, 2015, as the show was concluding its run at the MCA in Chicago. On the occasion of the exhibition's takeover of the Brooklyn Museum, here is the review once more…. Striped bodysuit for Aladdin Sane tour, 1973. Photo: Masayoshi Sukita. © Sukita / The David Bowie Archive 2012. “David Bowie Is,” the museum retrospective of the singer that recently concluded its run at the Museum of Contemporary Art in Chicago, featured virtually every artistic medium imaginable. Included works extended to music, film, video, fashion, and, in Bowie’s portraits of his Berlin running buddy Iggy Pop, painting. One display case featured the star’s long-retired cocaine spoon—a redundancy, considering the exhibition’s inclusion of his “Life on Mars?” video. The show originated at London’s Victoria and Albert Museum and made its sole U.S. stop in Chicago, where it was greeted with the crowds and fanfare of a blockbuster. The outpouring of interest seems sensible: Absent from public performance for nearly a decade, Bowie is pop’s missing man. His mark remains everywhere; he is nowhere. “David Bowie Is,” which was produced with the subject’s cooperation, if not curatorship, made a resounding case for his significance. To view the exhibition’s many rooms detailing his work in the 1970s was to peak into the 1980s. The phlegmatic British vocals that would dominate a corner of ’80s pop and the nervous mutability of music and media that would define Madonna (to say nothing of Gaga) have roots here; arguably, so does Michael Jackson’s cheesy white Thriller suit. In one displayed video, 1979’s “Boys Keep Swinging,” Bowie appears as his own backup singers, garbed in the elaborate gowns and wigs of female drag. What seems shocking about the video, however, is the main image of Bowie ostensibly as himself, clad in the dark suit of a prototypical mid-80s yuppie. It’s this look—which, for the record, predates Bret Easton Ellis’s debut by six years—that appears to be the video’s true act of drag. A museum show about a pop star inevitably runs into limitations. In an exhibition of a painter, visitors directly confront the subject’s primary source: the painting is the ultimate art. Even for a multidisciplinarian such as Bowie, the true art lies in his records and performances; the stuff inside display cases can seem secondary, if not trivial. But the aim of this exhibit, where headphone-clad visitors roamed as an army of enthralled zombies, was immersion. It was presented with high-minded care and, at least when covering the years that matter, the exhaustiveness of a box set. Over 400 items were on hand: photographs, handwritten lyrics, a monstrous set of keys from the musician’s Berlin apartment, even an old pocket map for the West Berlin subway. There were also more than 60 stage costumes, most fetchingly the pear-like black-and-white jumpsuit that Kansai Yamamoto designed for the Aladdin Sane tour. Even all these years on, we discover new sides to the pop star: Meet Ziggy Stardust, the world’s most glamorous hoarder. But the exhibition’s showstopper was drawn from nobody’s closet. Rather, it was the famous video of Bowie performing “The Man Who Sold the World” on Saturday Night Live, in the waning days of the 1970s. The video deserved greater prominence at the MCA, if not an entire museum to call its own; it also would have benefited from the other two songs recorded for the episode. Nonetheless, the clip could move mountains. Bowie is accompanied by Klaus Nomi and Joey Arias, vanguard figures from the nocturnal club world, both clad in monochromatic Thierry Mugler dresses. The men carry Bowie to his microphone as if he is a children’s toy. Wearing a cardboard tuxedo that was designed by the singer and Mark Ravitz under the spell of 1920s Dada, Bowie sings with the bemused detachment of a Martian. Space alien analogies always fit Bowie—after all, we are talking about the Man Who Fell to Earth—but they seem particularly apt for the SNL appearance. At the taping, he was newly returned from self-imposed exile in West Berlin, introducing irrefutably avant-garde notions to a mainstream arena. (Not for nothing did Kurt Cobain cover this song in Nirvana’s MTV Unplugged set.) The ’80s—which thwarted the world’s rock stars where no drug or label chicanery ever could—were mere days away. Bowie seemed intent on ending his decade of dominance in spectacular style. The appearance is not an act of subversion so much as it is a sterling media performance—pop as art and back again. Jay Ruttenberg is editor of The Lowbrow Readerand of its book, The Lowbrow Reader Reader. He has written for The New York Times,The Boston Globe, and other publications. 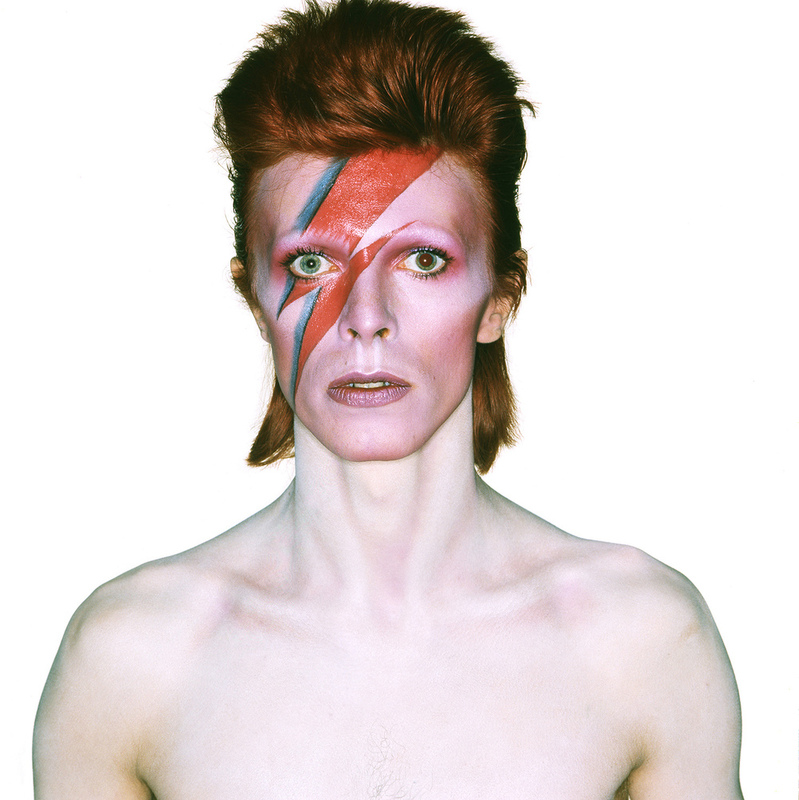 Album cover shoot for Aladdin Sane, 1973. Photo: Brian Duffy. © Duffy Archive & The David Bowie Archive. One more symposium on Fashion in Film is is taking place at the CUNY Graduate Center this Monday May 2nd from 5 to 7:30 pm. Among the impressive roster of speakers are Caroline Evans, who will speak on her current research on the early history of modelling and the fashion show. "Since the emergence of cinema in the late-19th century, the role of costume, fabrics, and fashion has been crucial in conveying an aesthetic dimension and establishing a new sensorial and emotional relationship with viewers. Through the interaction of fashion, costume, and film it is possible to gauge a deeper understanding of the cinematic, its complex history, and the mechanisms underlying modernity, the construction of gender, urban transformations, consumption, technological and aesthetic experimentation. Jody Sperling will speak on “Loïe Fuller and Early Cinema;” Caroline Evans Michelle Tolini Finamore on “‘Exploitation’ in Silent Cinema: Poiret and Lucile on Film;” and Drake Stutesman on “Spectacular Hats! A New Kind of Identity in a New Kind of Love (1963).” With moderator Amy Herzog and respondent Jerry Carlson." The symposium which is organized by Eugenia Paulicelli in conjunction with the Fashion in Film Festival is co-sponsored by the Concentration in Fashion Studies, MA in Fashion: Theory, History, Practice in the MA Liberal Studies Program, Film Studies, Women’s Studies and the Center for Gay and Lesbian Studies. UPDADTE: The first in two seminars is taking place this Tuesday April 19th at the Cuny Graduate Center. Titled Metamorphoses: Clothing in Motion from Early Cinema to Contemporary Fashion Film, the seminar is moderated by Eugenia Paulicelli and its speakers include Penny Martin (of GentleWoman), Antonia Lant and Donald Gregg, in addition to festival curator Marketa Uhlirova. The tireless curator and fashion scholar Marketa Uhlirova brings her "Fashion in Film Festival" to New York City. For this exciting edition of the festival, "Birds of Paradise," she partnered with the Museum of the Moving Image's Chief Curator David Schwartz, Ron Gregg at Yale University, and Eugenia Paulicelli at the Graduate Center, CUNY. The festival, which is hailed as "a major extravaganza in costume spectacle, dance and diabolical glamour," takes place from April 15 to May 2nd at the Museum of the Moving Image, while a seminar on the topic is scheduled for April 19th at the CUNY Graduate Center. For a full program of the festival, please visit the Fashion in Film Festival site. Suspended like birds caught in mid-flight, the breath-taking creations of the Kate and Laura Mulleavy of the Rodarte label are presented as sculptures in an exhibition that opened on March 4 at the Museum of Contemporary Art in Los Angeles. On display in "Rodarte: States of Matter" are twenty pieces selected from the designers "White Collection" (Fall 2010), "Black Collection" (Spring 2010), "Red Collection" (2008) as well as the Odile/Black Swan tutus worn in the movie "The Black Swan". The title of the exhibition refers to the presentation of "inanimate objects in a state of flux, or animation, signifying the temporary states that material can assume." Unconventional materials and processes are the hallmarks of the Rodarte label. The Mulleavy sisters subject fabrics, gauze, cotton cheesecloth, wool, rope, leather,and other materials to alchemic manipulations such as burning, stretching, weaving, dying, and stretching. They then layer materials, colours and textures into wearable works of art. With no formal training in fashion design, the two sisters started the Rodarte label in 2005 and in a short time have achieved great acclaim for their work which presents a mix of hard/soft and ugly/beautiful elements. Taking inspiration from the world around them, previous collections have been inspired by concepts such as horror films, architectural elements and California condors. In 2010, an exhibition of their work was presented at the Cooper-Hewitt Museum in New York confirming their place as designers who create art that becomes fashion. This exhibition at the MOCA Pacific Design Centre in West Hollywood was designed by runway producer Alexandre de Betak, who is also a long-time collaborator of the Mulleavys. Initially the presentation seems quite straightforward as the displays are grouped according to color with the black garments in the first level gallery and the white and red garments in the second level gallery. Suspended by wires from the ceiling, each garment is shaped by a poured resin mannequin form which is largely invisible to the viewer, creating the illusion of a body and enhancing the focus on the garments as singular sculptural objects. But it is the combination of static elements, moving elements and a light installation that make this an authentic contemporary art presentation. Several of the tutus also spin gently giving the illusion of a ghost ballerina doing pirouhettes. Some of the gowns are suspended over layers of fluorescent tubes that change in colour and intensity in a looped light show that goes from soft and pretty to hard and flashy. This is particularly effective for the grouping of gowns from the Red Collection that includes the bloodied tutu from the final scene in the Black Swan and also seems to reference the Mulleavy sisters' fascination with horror films. Unfortunately the sequencing is so rapid and the cycle so short that it feels like there are only seconds of normal lighting conditions. While the play of light is consistent with a cutting edge contemporary art presentation, it is distracting for visitors that simply want to appreciate the inherent beauty of the garments. Plus it is almost impossible to ignore the loud fan and the clicking noises of the light show. Such minor flaws are quickly forgotten when compared to the chance to see a Rodarte creation up close. Photos of their creations do not convey the magic of their work. It almost seemed as if the Rodarte gowns were made by fairy sprites as there are no visible seams or points of attachment. Ethereal in their beauty, they are truly works of art. "The 3rd Fashion in Film Festival is proud to present Birds of Paradise, an intoxicating exploration of costume as a form of cinematic spectacle throughout European and American cinema. There will be exclusive screenings of rare and unseen films, plus two special commissions as part of the season: an installation for Somerset House by the award-winning Jason Bruges Studio and a London-wide Kinoscope Parlour, an installation of six peephole machines designed by Mark Garside after Thomas A. Edison’s kinetoscopes. From the exquisitely opulent films of the silent era, to the sybaritic, lavishly stylised underground films of the 1940s -1970s, costume has, for a long time, played a significant role in cinema as a vital medium for showcasing such basic properties of film as movement, change, light and colour. The festival programme explores episodes in film history which most distinctly foreground costume, adornment and styling as vehicles of sensuous pleasure and enchantment. Experimental films by Kenneth Anger, Jack Smith, Ron Rice, José Rodriguez-Soltero, Steven Arnold and James Bidgood constitute one such episode. Their decadent, highly stylised visions full of lyrical fascination with jewellery, textures, layers, glittering fabrics and make-up unlock the splendour and excess of earlier periods of popular cinema, especially ‘spectacle’ and Orientalist films of the 1920s; early dance, trick and féerie films of the 1890s and 1900s; and Hollywood exotica of the 1940s." Please, visit their site for full programming. Fashion Projects is a journal focusing on fashion, art and visual culture. © Fashion Projects 2016 All rights reserved.